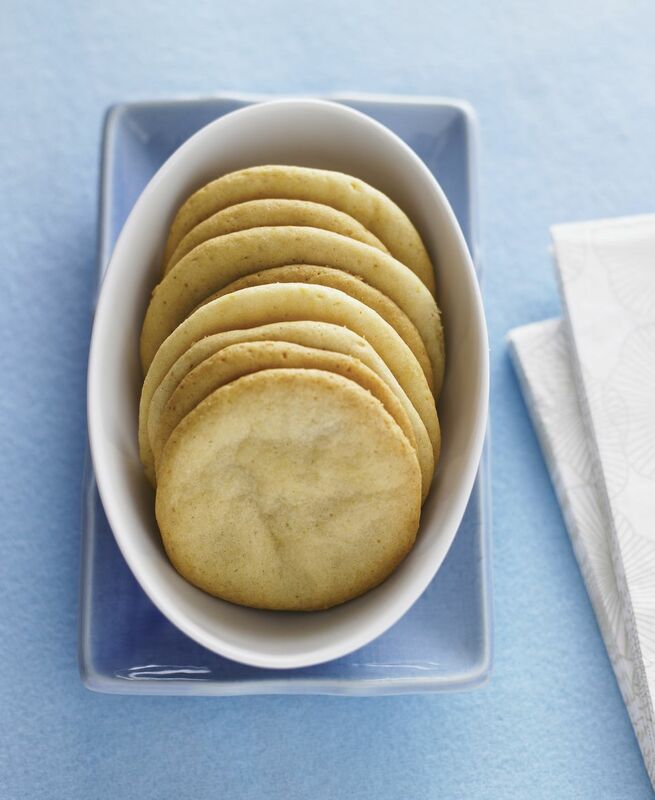 These lemon icebox cookies are butter-rich cookies with lemon flavor from the lemon peel and juice. Icebox cookies, also known as refrigerator cookies, are super easy and they are uniform in size, so they look especially nice on a cookie tray, and they can be stacked. Another advantage is that they can be baked at any time. You can freeze the well-wrapped roll of cookie dough for 2 to 3 months. Just slice and bake cookies whenever you have a craving. In a bowl, combine the flour, baking soda, and salt. Whisk to blend thoroughly and set aside. In a mixing bowl with an electric mixer, cream 1 cup of the granulated sugar with the butter until light and fluffy. Beat in the egg, lemon juice, and lemon zest. Gradually blend in the flour mixture into the creamed mixture. Shape the dough into two rolls about 2 inches wide and 7 inches long. Wrap the rolls in waxed paper or plastic wrap and refrigerate the dough until firm, about 1 to 2 hours. Unwrap the cookie dough and cut into uniform slices about 1/4-inch thick. Sprinkle slices lightly with the remaining sugar and place on the prepared baking sheets. Bake in the preheated oven until lightly browned around the edges, about 12 minutes. Cool the cookies on a rack and store in an airtight container. Place a ruler beside the roll of cookie dough. The ruler will help make your slices uniform in thickness. Make the rolls of cookie dough round or rectangular. Wrap the rolls of dough with plastic wrap or wax paper, then wrap again in foil and freeze for up to 2 to 3 months. Slice the frozen rolls of cookie dough. When you bake the frozen cookie dough, add a minute or two to the baking time.